Scrap n’ Dipity – Beary Love…..
Hello, how are you on this first day of March?!! I just can’t believe how quickly this year is going! Nearly Spring folks – thank goodness! 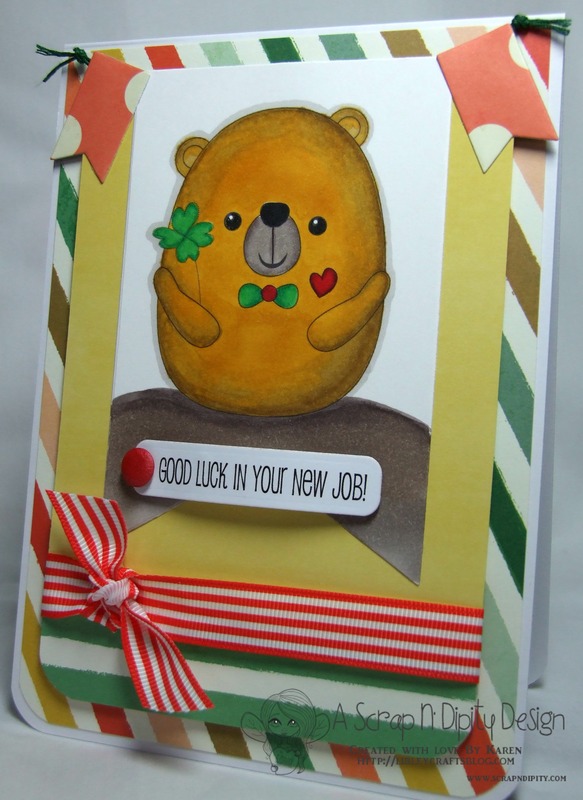 Well, I’m here today to share a card that I have made for my hubby who will be starting a new job at the beginning of April. I have used this sweet bear image from Scrap n’ Dipity called Beary Love and would you believe it – you get 5 images in this set! Wouldn’t this be a great image for St Patrick’s Day too?! Have you had a peek at the Scrap n’ Dipity store yet? Alisha releases new digi’s every Friday and there’s our Scrap n’ Challenge Blog too that you can get involved in. If you need some inspiration you could even pop over to the Scrap n’ Dipity Blog to see what fab creations the design team have come up with too. To make this card I also used papers by My Mind’s Eye – Market Street, Spellbinders Banner and tag Dies, Sizzix Banner Die, twine, ribbon, Card Candi and Spectrum Noirs. The sentiment was done on the computer. Awww…darling card with the bear! I’m sure your husband will appreciate this thoughtful sweet card for him! Good luck to him on his new job! A cute image, so well colored, looking fluffy and huggable. Love the effect of different striped papers and ribbon!